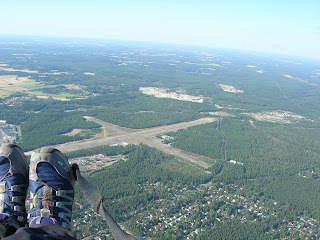 Today a smallish group of pilots gathered at Hyvinkää airfield to enjoy the wonderful summer weather. With many Finnish pilots fled to southern locations such as Macedonia, and many others back to work, there wasn't the usual congestion. With the stable high pressure system conditions were initially weak but the August sun still has enough power to cook things up. After 3 PM most pilots managed to stay aloft. I myself flew for 2 hours, practiced a few low saves and also tried to get away a bit. The northerly wind combined with the low ceiling made XC a bit too difficult though. Eventually the thermals did develop into broad areas of lift but with small very strong cores up to 5 m/s. Some of these cores broke through the inversion, but due to the airspace restrictions we could go only approx. 70 m above the inversion. After 6 PM the thermal activity quickly died out, and many very happy people landed shorty after one other.